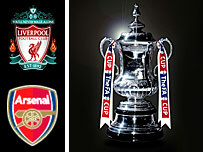 Holders Liverpool have been drawn at home to 2005 winners Arsenal in the third round of the FA Cup. The 2004 Cup winners Manchester United were also handed a tough home tie against Martin O'Neill's Aston Villa. Tamworth are at home to Norwich, while Nottingham Forest will meet Charlton after beating Salisbury on a replay. Also decided on a replay was Bolton's opponents, with Doncaster winning through to the match against the Premiership side after they beat Mansfield. But it is Arsenal and Liverpool that will meet at Anfield in the round's biggest draw, five years after the two clubs met in the final of the competition in 2001. Michael Owen scored two late goals in that match as the Reds won the trophy 2-1. Arsenal got some revenge by knocking Liverpool out the following season in the fourth round. The two sides also met at the semi-final stage in 1980, with three replays needed before Arsenal won through to the final, and the 1971 final which the Gunners won in extra-time. Ties will be played on the 6 and 7 of January.